In Hear This, A.V. Club writers sing the praises of songs they know well. This week: Our favorite songs featuring unusual instruments. The Monkees always seemed to be at war with themselves over their prefabricated status and their desire to be a real band. Although they were brought together via a classified ad that was released 50 years ago last week— two actors, Micky Dolenz and Davy Jones, and two musicians, Peter Tork and Michael Nesmith—to star in a TV show, the four Monkees soon attempted to be a band for real. After an immediate hits-filled debut and a quickly turned-around second release, the band took command and played all the instruments on third album Headquarters, which also featured some songs written by Nesmith and Dolenz. As an actor-turned-musician, Micky Dolenz was possibly the show’s biggest surprise, a fun comic player who also had a perfect, affecting, and effective rock voice, which often sounded even better when backed or paired with Nesmith’s twangy vocals or Jones’ teen-troubadour ones. Dolenz was also known for his short attention span; worn out from playing drum tracks on Headquarters, he gladly turned the percussion over to session players for the next release, the under-appreciated Pieces, Aquarius, Capricorn, & Jones Ltd. By then Dolenz had refocused his attention to experimental new instruments, like the Moog synthesizer. He owned the third Moog ever sold commercially; the first two went to Wendy Carlos and Buck Owens. For PAC&J, Nesmith had written a song inspired by the Sunset Strip “hippie riots,” in which young music lovers protested a constraining curfew. “Daily Nightly” is more poetic than anything else, with no chorus or bridge, and tumbling verses that feature lines like “a world that glitters glibly” at “the ones who’ve found the questions but no answers.” As with “The Girl I Knew Somewhere,” Nesmith turned the vocals on his own composition over to Dolenz, who had a higher register. 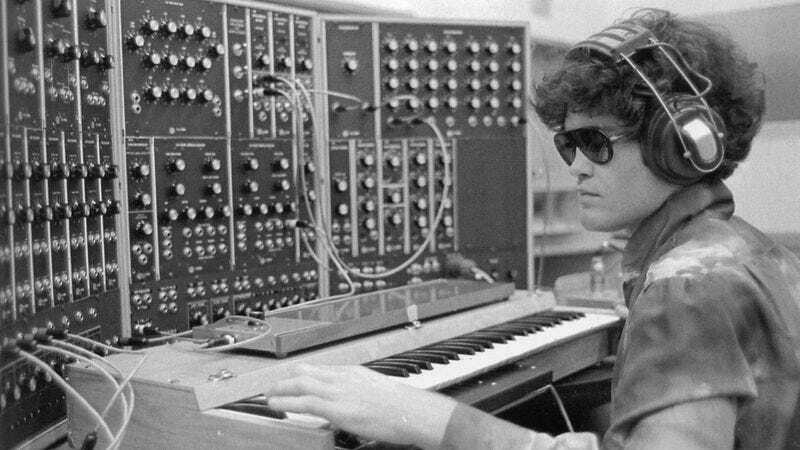 Dolenz brought his Moog into the recording, kicking off the track with strange, space-age sounds that highlight the surreal feel of the song; in the video, his love-bead-wearing bandmates just sit around and watch Dolenz play with his favorite new musical toy. “Daily Nightly” is widely considered the first use of the Moog on a rock recording, or at least the first one that most people heard, because it was broadcast on a national TV show. The Moog soon found its way onto albums like The Beatles’ Abbey Road, The Notorious Byrd Brothers by The Byrds, and Simon & Garfunkel’s Bookends. For The Monkees, the experimental track helped move them from their Pre-fab Four status into the latter, trippy part of the decade on an album that showed that they offered more musical resonance than reruns.